Hello all and thank you for reading my blog. I have moved my blog to http://jpliskow.wordpress.com/. It should look and feel the same. I just wanted streamline my web presence to be more consistent. Please update any and all RSS readers too. I’m back in Michigan ready to finalize all our preparations for when we actually collect data come April and am back in Arizona. The trip provided us some very good time to figure out exactly what we hoped to accomplish with the project. 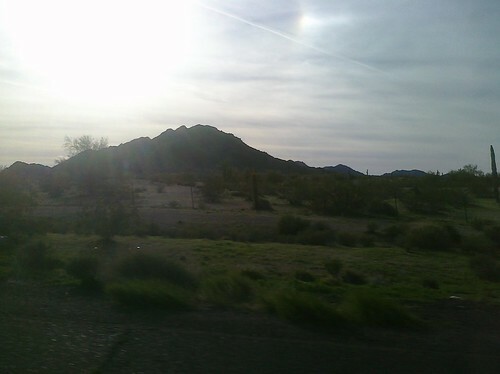 We met with individuals in Arizona that will help to secure some of our logistical needs. The weather was beautiful. Can’t say I was there long enough to get a tan, but I did feel the heat. Had to use air conditioning once or twice to cool off. I’ve never been to that part of the country and the landscape seemed to extend to the horizon with little more than brush and sand. DRY DRY DRY. I’ll be happy to go back in a few weeks and hopefully check out the local scene more. Not sure if there really is much but the maybe we’ll meet some nice locals to show us around town. Beyond the travel I’ve got some more work to do to finalize our instrumentation and data acquisition system. It’s close. As part of the research project I’m working on we are doing most of our testing in Arizona. I won’t share any of the details pertaining to exactly where or with who, not really sure if we should share that depending on the contract. Either way, we are spending a couple of days this week in Arizona to check out the test sites and plan out the logistics of out April trip back for three weeks of testing. Tonight I learned about the life of being a professor from the 3 on the trip. Beyond that it was a long day of travel and the gym in the hotel has better treadmills than the ones at school. For now I’m working on getting ready to work. I’m figuring out how I’ll analyze the data and deciding exactly what I’ll do. From day to day I’ve been adding to and editing my thesis proposal. From two weeks ago its about 20% longer and probably another 20% to go. Though I have a feeling the last 20% will be the hardest to finalize. Either way, in the mean time I’m getting my head around the mounds of data from a previous study that I want to pull some new understanding from. So what do you do with a bucket of data. Well, a shovel would be nice but I need a screen to sift out the good stuff and put what comes out in some sort of reasonable order. I’ve completed all the credits required for my Masters and all I have left is to do the research and write my thesis. I’m working on a research project involving hybrid vehicles and blind pedestrians. In the next few weeks I’ll be hashing out my proposal. Once that is complete I’ll have a much better idea about exactly what I’ll pull out of the research project. More to come soon. I have a birthday and I am graduated in just a few weeks and I thought I’d put together a list of things I’ve been eyeing. Usually I would not have any sort of preference for gifts. Your time and company is all I ever want. But I’ll forgo that for those that may want to get me something special. Uh… Sarah Silverman for the Great Schlep?